Caribbean Airlines and Boeing announced this week the airline has chosen to enhance and renew its single-aisle fleet with the 737 MAX 8. The move comes as no surprise as the airline has long operated the Next-Generation 737 and will take delivery of 12 MAX aeroplanes in the coming years. Caribbean Airlines Chief Executive Officer, Garvin Medera said, "Boeing has been by our side since Caribbean Airlines was founded twelve years ago using the 737-800. The 737 MAX allows us to continue offering a safe and comfortable experience for our passengers, while significantly improving fuel efficiency and environmental performance. All of these elements position us for long-term success." The 737 MAX 8 will seat up to 160 passengers in Caribbean Airlines' three-class configuration featuring the "Caribbean Plus" Cabin and are powered by the latest technology CFM International LEAP-1B engines. 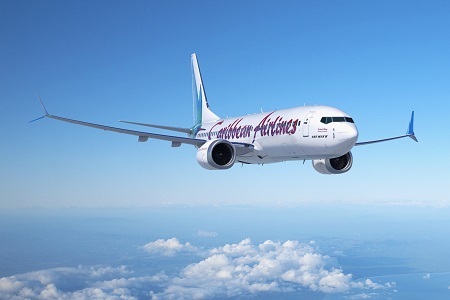 "We are honoured that Caribbean Airlines has placed its trust once again in the Boeing family and chosen to bridge to the future with the 737 MAX 8. Its selection reaffirms the partnership we have built together with the Next-Generation 737 family," said Ihssane Mounir, senior vice president of Commercial Sales & Marketing for The Boeing Company.